In this second part of our interview with Mark Kane, Mark addresses in more detail the kinds of organizing that was taking place in Grand Rapids around the nuclear freeze campaign and who was involved. Mark stresses that there was an intersectional approach to how organizing was taking place in Grand Rapids and how the Nuclear Freeze Movement was making connections to economic issues, hunger and US military intervention around the world. 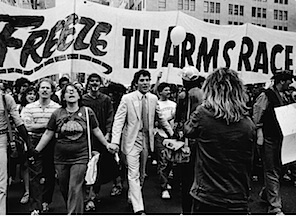 Mark and several other people went to New York for the Freeze rally at the United Nation in 1982. 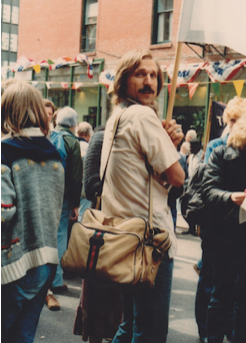 To the right is a picture of Mark at that rally in 1982, a rally that saw 1 million people march for disarmament. One other issue that Mark addresses in this interview is what the freeze movement gave birth in the 1980s, in terms of other social movements. He also addresses why it is important that we know and learn from this history. This entry was posted in Anti-Nuclear Movement and tagged Grand Rapids nuclear freeze movement, Mark Kane interview. Bookmark the permalink.